Here is yet another Supergirl cover, issue 48, along with some process shots. As you can see from the above thumbnail, the final image stayed pretty close to my initial concept. In fact, when I was adding some color to the thumbnail in Photoshop to submit for editorial approval, I was concerned that I wouldn't be able to reproduce the "scream ring" effect on the final- I was just screwing around when I came up with it and couldn't remember exactly how I did it, but I liked it. My goal was to get the final cover pretty close to the thumbnail. I agonized over how to draw the actual cover; I knew that it would technically be much easier to draw Silver Banshee and Supergirl on two different pieces of paper so that I could work with them separately in PS, but I would be sacrificing a nicer looking piece of finished art. In the end, practicality won, and I have yet another cover drawn in pieces. 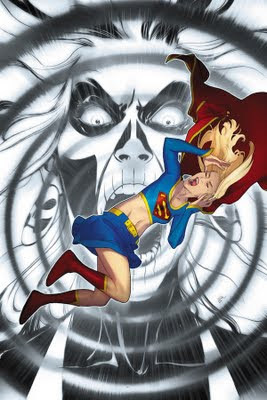 It was the right choice, however, because having Supergirl on her own layer floating over Silver Banshee allowed me to add all of the effects without having to make selections or deal with weird edges around Supergirl. I was also able to adjust Supergirl's size and position with ease since there was a complete background behind her, which is pictured above before making any adjustments. 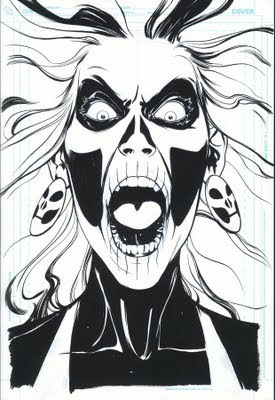 I drew Silver Banshee in blue pencil, then inked her with a brush and india ink. 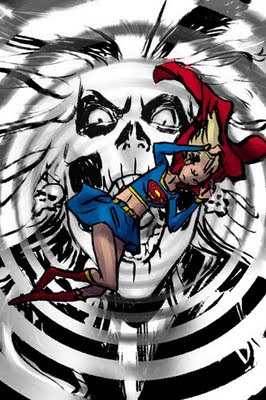 Above is Supergirl as she was drawn on a vellum overlay. Vellum is like a heavy tracing paper, so the transparency allowed me to draw her basically where I wanted her over the background. Supergirl was first drawn with blue pencil on a sheet of vellum, then I laid another sheet on top of that and drew the final lines in ink with a pen. I could have just inked directly over the blue pencils, but I was really struggling with some parts of the drawing (including the skirt, as usual) and wound up with a lot of smeared pencil. Vellum is easily erasable, so pencils can smear, and sometimes ink doesn't want to stick. A fresh sheet took care of the problem. The color was done in Photoshop, and I tried to keep it fairly simple. The most important part was getting the balance right between Supergirl and the black and white background so that the contrast is striking, yet reads well. I had to lighten the background a touch and added a little bit of a soft halo of white around Supergirl to help pop her off the background. After staring at it for a while and nearly getting dizzy, I decided it was done.